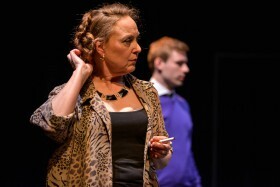 Misery loves company in Who’s Afraid of Virginia Woolf? BEAR & Co.’s latest production, Who’s Afraid of Virginia Woolf?, is a story about a couple whose only commonality is the loathing they share for one another. George, a college professor, and Martha, his wife and the daughter of the College president, are at each others throats from square one. Bandying insults with precision, as though to see who will be the first to succumb to a death of thousand tiny cuts from a barbed tongue—that is if their self-medication doesn’t put them down first. It’s obvious that this is a nightly routine, insults with an extensive pairing of various spirits, but Martha has introduced a new element to tonight’s game; she has invited a younger couple to drink with them, Nick, a promising and handsome new professor, and his wife Honey. Despite trying to cut the visit short, Nick and Honey, as the late evening turns to early morning, find themselves slowly succumbing to the miasmic effects of the toxic games the older couple play. Rachel Eugester and Cory Thibert. Photo by Andrew Alexander. 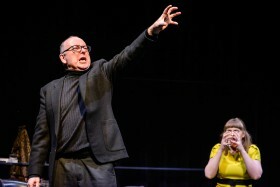 Rachel Eugster and Paul Rainville play the “direly” beloved couple, Martha and George, and they do a superb job at playing off one another, creating a kind of enraged feedback loop that builds and builds throughout this three act performance. Each of them has this unnerving ability to flip this emotional switch that allows them to go, at a moment’s notice, from calm and playful to enraged and psychotic. Paul Rainville and Grace Gordon. Photo by Andrew Alexander. Rainville especially comes into his own in the third act. While his character seems a touch disconnected at the start of the performance, you will literally see the spray erupting from his mouth as his character finally snaps. It’s around halfway through the second act that the black comedy of this piece gets difficult to laugh at. You get the feeling that you’re witnessing something intensely private, which is never a very comfortable thing to sit through. Hatred and animosity are some of the hardest feelings to believably act out for an audience, and when actors fall short it can turn serious scenes into a farce. While I can’t say that I eagerly anticipate that sensation of discomfort, in a show like this, it’s evidence that the actors are absolutely nailing their performances. However, don’t assume that this is a play that is simply about a kind of gendered hatred; there is a lot more to it than that. It revolves around George and Martha’s deep-seated inability to communicate and how, despite their eternal enmity, they have become vitally reliant upon one another. Grace Gordon and Cory Thibert. Photo by Andrew Alexander. I loved nearly everything about this performance, from the simple yet stylish set design—with its excessively well-stocked bar—to the quirks and idiosyncrasies that each of the actors brought to their character. While I highly recommend this to anyone with an interest in black comedy, theatre of the absurd, notions of existentialism, and/or social relationships. So long as you can stomach vulgarities and depictions of violence, you will certainly enjoy what BEAR & Co. has to offer. But that’s just what I think! I want to hear your opinions as well, so don’t hesitate to leave a comment below!